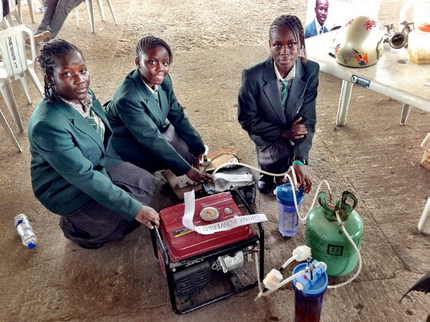 An amazing invention by four teenage girls, brought a big surprise in this year’s Maker fair Africa in Lagos, Nigeria. Using urine plus some science and chemistry, they were able to power a generator to produce electricity for six (6) hours in every one (1) liter of Urine. Truly ingenious, eco-friendly invention. With the growing trend in green technology, we have heard a lot of amazing concepts and inventions like seaweeds into bio-fuel, water as automobile fuel, turning plastic trash into fuel and even recycling urine as drinking water. But these teenage girls definitely has some thing different in mind. Disposing our own wastes and using it to generate electricity. It works by using an electrolytic cell to separate hydrogen from urine. After using a water filter for purification, it is then pushed into a gas cylinder which in turn pushes the hydrogen into a cylinder of borax, to remove moisture. This process produces a purified hydrogen gas, used to push and drive the generator. A truly ingenious invention. Still needs some work done. No specification has been release yet, but both negative and positive feedback are out. On the positive side, obviously is in the use of abundant resource like urine. On the other hand, just like any other green technologies. The main concern is energy efficiency, especially with the energy consumed by electrolytic cell. And with the involvement of hydrogen on the process, concerns are raised with security risks in using it creating explosives.